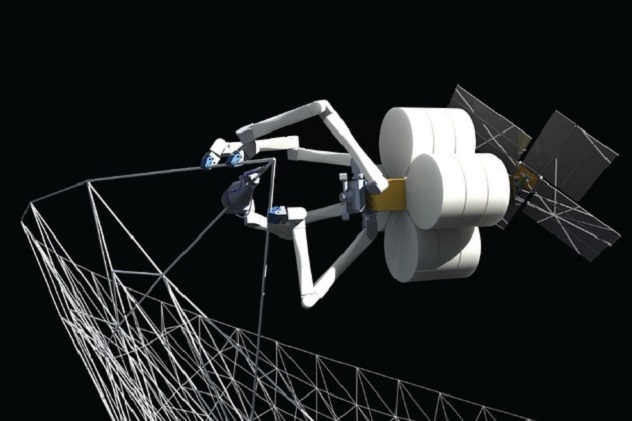 A division of Tethers Unlimited Inc., a space technology company based in Bothell, Wash., says it has signed a contract with a big-name spacecraft provider to demonstrate how future satellites could build their own frameworks in space. The deal calls for Tethers Unlimited’s business division, known as Firmamentum, to fly its manufacturing hardware on a telecommunications satellite as part of Space Systems Loral’s Dragonfly program. Space Systems Loral is one of the world’s leading builders of satellites and spacecraft systems. Firmamentum is working on a technology known as the “Trusselator,” which is designed to fabricate large, lightweight truss structures out of carbon-fiber composites. Such structures could help support antennas, sensors, solar arrays and other components. This entry was posted in GeekWire and tagged Manufacturing, Space, Tethers Unlimited. Bookmark the permalink.